Our laser focus advocacy for real estate professionals helps us stay ahead of industry changes enabling us to provide substantial value to our clients. With diverse experience in the business of real estate, we provide clients unique insight unmatched in most other law firms. Headquartered in the Historic Downtown Atlanta, our firm's focus is to help families and entities navigate through acquisition, ownership, development and construction of real estate. Our clients receive honest and sophisticated services derived from accurate understanding of nuances and best practices. Nemat Law Firm is the leading counsel of choice on zoning, permitting, and investment immigration EB5 matters. Find out how we can serve you in your legal needs. Sasan has negotiated and handled various complex real estate and business issues. His commercial real estate journey started in 2011 when he recognized the once in a lifetime opportunity afforded for market entry to new participants. While attending law school, he continued to work with syndicators of Multifamily assets in southeast United States. He is currently the lead principal in a commercial retail development located on USA HWY 41 in Cartersville, GA .
Sasan is a student of the world having visited approximately 20 countries. While enrolled in Georgia State University College of Law, he worked as a graduate research assistant for the Institute of International Business at Robinson College of Business. In addition, he served as a fellow for the Atlanta BeltLine Inc. as well as the Center for Comparative Study of Metropolitan Growth. 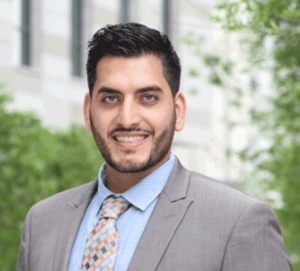 Upon graduation, he worked for a boutique reputable business law firm before starting Nemat Law Firm. Since then, Attorney Nematbakhsh has appeared on local and national media as legal expert. As a mediator, Sasan has settled over 400 law suits pertaining to real estate disputes. As an attorney, he is a firm advocate of his client's interest with a laser focus on achieving client objectives. In his spare time, he can be found playing flamenco cajon, playing soccer, walking the BeltLine, attending Atlanta United games and hiking trails at Chattahoochee River with his dog. Attention multifamily brokers, investors, and developers: "Uniquely qualified local expert chimes in on the new workforce housing zoning mandate". Nemat Law Firm at the forefront of changes in the Georgia urban land use law. Thank you! Your inquiry is very important to us and we will get back to you within two business days.